Today’s episode of Star Plus Yeh Rishta Kya Kehlata Hai starts with Kartik Goenka (Mohsin Khan) and Naira driving their car. Suddenly a paper comes on the front mirror of their car and Kartik Goenka loses control as a lorry is coming from the opposite side, but he manages to slow down and control his car. Naira is scared. It is Aditya who is drinking liquor and driving his car and his fit of anger against Naira and Keerti he ends up causing the accident. Naksh and Keerti before the car crash are seen discussing things when he asks his pregnant wife to relax. Keerti tells that she does not want to see Aditya’s face again. Aditya sees Kartik Goenka and Naksh’s car and follows them. There Luv and Kush are missing Kartik Goenka and while being treated for fever they utter his name. The weather gets rough and things start to fall into the house. The car crash is shown with great detail - Kartik Goenka and Naksh are seen coming from one direction and Aditya is coming from the opposite side directly towards them. Keerti and Naira get scared on seeing this. Aditya comes directly and collides with their cars. Aditya stops his car and looks back. H what has happened to Kartik Goenka and Naksh’s car. Aditya comes and sees the car upside down and someone from the crowd shouts to call an ambulance as the lady in the car is pregnant. Suhasini is tensed and tells Manish to call Kartik Goenka or Naksh and enquire are they all fine. Manish and Akhilesh try their number but it is coming out of the network area. Suhasini prays to god for the safety of her children. Aditya sees Keerti and Naksh in the car and thinks where is Kartik Goenka and Naira’s car gone. Manish sends one of his employees to go and check and inform them about the children. Akhilesh comes and tells that one of his friends who is having a hotel in the highway has told him that there was a major accident in the highway. Listening to this Suhasini gets more tensed. There Naira gets conscious and calls Kartik Goenka’s name and tells him to get up and asks whether he is fine. Kartik Goenka asks Naira is she is and the baby fine. Kartik Goenka tells Naira we have to go to the hospital immediately. The baby kicks Naira’s stomach and seeing this they both are happy. Naira tells Kartik Goenka where are Naksh and Keerti. Kartik Goenka and Naira get out of the care and go in search for Naksh and Keerti. There at the accident spot, people have gathered and all are tensed. The police arrive at the spot and seeing Naksh and Keerti tells that he knows them. 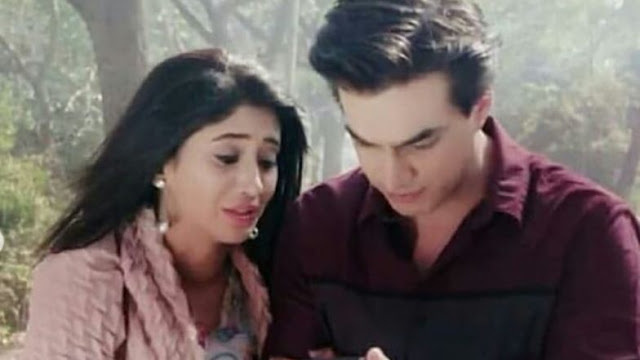 Kartik Goenka tells Naira to wait in a spot and tries Naksh phone and asks where are they and comes to know about their accident but tells Naira that all is well. The manager comes and asks them if everything is fine, Kartik Goenka tells him to take Naira to the hospital first and then to the house and he will come afterwards. Naira tells that she will come with him. Kartik Goenka tells that he has to do the formalities and lodge the complain and then he will come directly home. Kartik Goenka tells the manager not to tell anything in the house now and that he will come and tell everyone. Kartik Goenka calls again on Naksh’s number and the police tell that Naksh and Keerti had met with a major accident and they are both serious. In the precap, Kartik Goenka takes Keerti and Naksh to the hospital, the doctor says that Naksh is out of danger but Keerti has gone in the coma, Naira hears this.